Bridgeline Digital, Inc. is pleased to announce that Thomas Massie, President & CEO and Michael Prinn, CFO of Bridgeline Digital, Inc. (NASDAQ: BLIN) will be presenting at Taglich Brothers 11th Annual Small Cap Equity Conference May 6, 2014. 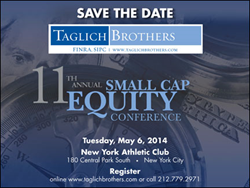 Bridgeline Digital, Inc. is pleased to announce that Thomas Massie, President & CEO and Michael Prinn, CFO of Bridgeline Digital, Inc. (NASDAQ: BLIN) will be presenting at Taglich Brothers 11th Annual Small Cap Equity Conference May 6, 2014. The Conference will take place at the New York Athletic Club, New York City. To request additional information or to register, contact Taglich Brothers at 212-779-2971 or visit http://www.TaglichBrothers.com. Bridgeline Digital (NASDAQ:BLIN), The Digital Engagement Company™, enables its customers to maximize the performance of their mission critical websites, intranets, and online stores. Bridgeline’s iAPPS® platform deeply integrates Web Content Management, eCommerce, eMarketing, and Web Analytics to help marketers deliver online experiences that attract, engage and convert their customers across all digital channels. Bridgeline provides end-to-end Digital Engagement solutions and boasts an award-winning team of interactive services professionals. Headquartered in Burlington, Mass., with nine additional locations throughout the U.S. and an Asia Pacific headquarters in Bangalore, India, Bridgeline has thousands of customers that range from middle market organizations to Fortune 1000 companies. To learn more, please visit http://www.bridgelinedigital.com or call (800) 603-9936.